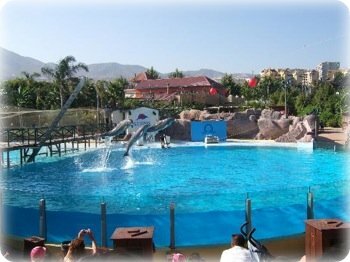 Selwo Marina is Andalusia's only delfinarium. It is located in Arroyo de la Miel, near Benalmadena. You were there? Please send us your review and grade. We would love to hear from your family! The park is divided in four zones over 1.7 hectares: 'Antilla' with the delfinarium, 'La Hondonada' with its exotic birds from South America, 'Amazonia' to discover the fauna and vegetation of the tropical jungle, and 'La Isla de Hielo' which reproduces the natural habitat of penguins. There is also a play area for smaller children. If you would like to experience the dolphins close up, try SPLASH, their new attraction where you can get into the water with the dolphins to play games and learn tricks. Hours: Always opens at 10:00am, but closing hours vary depending on the season. Generally closed, December and January. Consult their opening hours for more details.